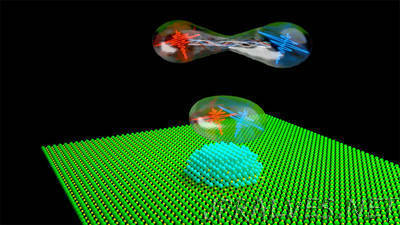 ” The potential for photon entanglement in quantum computing and communications has been known for decades. One of the issues impeding its immediate application is the fact that many photon entanglement platforms do not operate within the range used by most forms of telecommunication. An international team of researchers has started to unravel the mysteries of entangled photons, demonstrating a new nanoscale technique that uses semiconductor quantum dots to bend photons to the wavelengths used by today’s popular C-band standards. They report their work this week in Applied Physics Letters, from AIP Publishing. The researchers used quantum dots created from an indium arsenide and gallium arsenide platform, producing pure single photons and entangled photons. Unlike parametric down-conversion techniques, quantum dots allow for photons to be emitted only one at a time and on demand, crucial properties for quantum computing. A distributed Bragg reflector, which is made from multiple layered materials and reflects over a wide spectrum, then directed the photons to a microscope objective, allowing them to be collected and measured. Researchers and industry leaders have found that the C-band — a specific range of infrared wavelengths — has become an electromagnetic sweet spot in telecommunications. Photons traveling through both optical fibers and the atmosphere within this range experience significantly less absorption, making them perfect for relaying signals across long distances. Most entangled photons originating from quantum dots, however, operate near 900 nanometers, closer to wavelengths we can see with the naked eye. The researchers were impressed by the quality of the signal, Olbrich said. Other efforts to shift the emission wavelength of polarization-entangled photons of quantum dots toward the C-band tended to increase the exciton fine-structure splitting (FSS), a quantity that should be close to zero for entanglement generation. Olbrich’s team reports their experiment experienced less than one-fifth as much FSS as other studies in the literature. “The chance to find a quantum dot that is able to emit polarization-entangled photons with high fidelity is quite high for our specific study,” Olbrich said. With each successful experiment, the quantum communications community is seeing its field bend toward greater applicability in today’s telecommunications industry. Researchers hope that one day, entangled photons will impact cryptography and secure satellite communications.